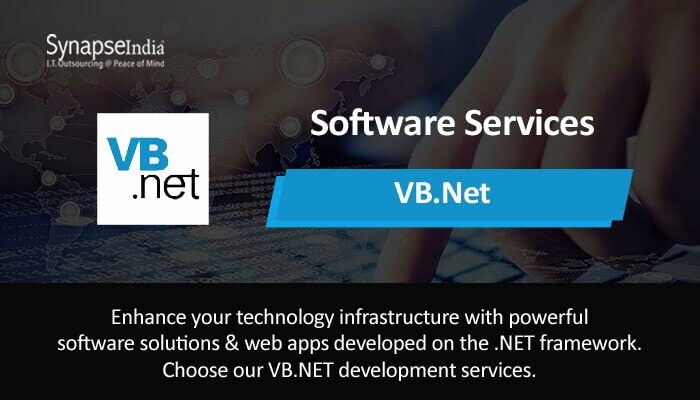 SynapseIndia offers a vast range of software services powered by programming languages like VB.NET that help businesses execute digital transformation. The company has a history of delivering thousands of software projects to enterprises around the globe. With its clients thriving in industries ranging from real estate to healthcare, the company promises to be a trustworthy technology partner. Its software services include software development, web design & development, mobile app development, eCommerce website development, and big data analytics among others. Digital transformation used to be a buzzword across industries not very long ago. But that has changed. Now, digital transformation has become a major development in industries, and many companies have put it at the top of their management and expansion agenda. As technological disruption continues to be an increasingly common occurrence, deployment of a competent software infrastructure has become imperative for businesses. SynapseIndia is perfectly equipped to serve businesses planning to sustain and grow in a market driven by technology. The global reputation of SynapseIndia as a reliable software provider keeps it committed to delivering impeccable software solutions. The software vendor uses languages like Microsoft VB.NET, which is a multi-paradigm, object-oriented coding language based on the .NET framework. It enables the developers to build solutions for the Windows operating system, web application, and mobile apps.